Xiaomi appears to have big plans in the European markets, a leaked list of upcoming smartphones suggest. The Chinese mobile maker has been expanding into Europe at a quick pace. A new Eurasian Economic Commission report is said to have surfaced online, hinting at a number of Xiaomi handsets that may launch soon. Among the listed smartphones, the Mi 7 Lite appears to be a mid-range variant of the anticipated Xiaomi Mi 7 flagship. The company is expected to launch the Mi 7 this month, as its 8th-anniversary smartphone. Additionally, handsets like Mi S-series, Redmi 6-series, Redmi A-series, and more have been listed. The EEC is a regulatory body in countries such as Russia, Kazakhstan, Belarus, and Armenia. 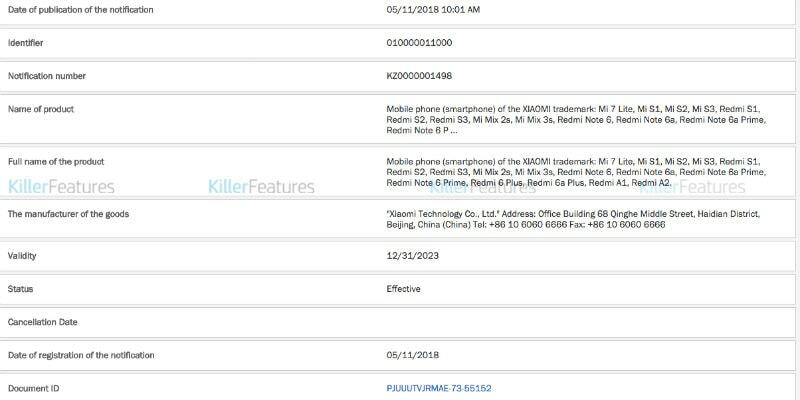 A list of Xiaomi products have reportedly been spotted on its site by KillerFeatures, and it mentions several unreleased smartphones in the company's Mi and Redmi lineup. Interestingly, the list also includes a few handsets, such as Mi Mix 2s and Redmi S2 - which have already been launched in other markets. As per the list, Xiaomi is expected to unveil a new Mi S-series of smartphones - Xiaomi Mi S1, Mi S2, Mi S3 - alongside Redmi S1 and Redmi S3. The Xiaomi Mi Mix 2s will also have a successor in Mi Mix 3s. However, there is no mention of a Mi Mix 3 smartphone. The EEC list also mentions smartphones like Redmi A1 and Redmi A2. Additionally, it has names of successors in the Xiaomi Redmi Note series - Redmi Note 6, Redmi Note 6A, Redmi Note 6a Prime, Redmi Note 6 Prime, Redmi 6 Plus, and Redmi 6a Plus - as well. It is worth noting that the listing was filed on May 11 and it is valid up to December 31, 2023, indicating that some of the smartphones may not even launch in 2018. It is unlikely that Xiaomi will launch the Mi Mix 3s this year, and we can expect the Redmi 6 lineup later this year or early 2019. However, the company may unveil the Mi 7 Lite and possibly one handset in the Mi S-series, in 2018.